UPDATE: Here's a link to my Shuttle News Roundup, updated daily. 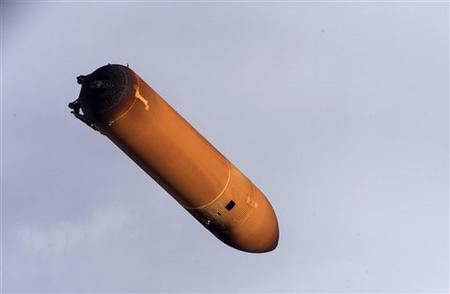 NASA has released photos of the large external Shuttle fuel tank after it was jettisoned. Clearly visible near the top of the tank in the image (actually the bottom of the bullet-shaped tank, since it is nearly upside down in the photo) is a rather large light-yellow area which has been stripped of insulating foam. Extensive photographic examination of the Discovery has not revealed any visible damage to the craft so far. Another examination using a camera mounted on the crane in the Shuttle's cargo bay will take place today. If everything checks out, the crew is expected to complete their mission to the International Space Station and then return home without incident on Sunday August 7. After the second orbital Shuttle mission, the paint was eliminated in order to reduce the weight of the Shuttle launch assembly. The Shuttle launch assembly consists of the Shuttle orbiter itself, two solid-fuel booster rockets, and the large external fuel tank. Morton-Thiokol manufactures the solid-fuel booster rockets, and Lockheed Martin manufactures the external fuel tank. This fuel tank holds liquid oxygen and liquid hydrogen fuel for the Shuttle's three main engines. 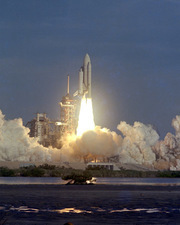 Its fuel supply is used up approximately seven minutes after launch, and the tank is jettisoned from the Shuttle orbiter. It is designed to fall back to Earth and disintegrate during atmospheric re-entry; the small amount of remaining debris falls harmlessly into the Atlantic ocean. My previous essay provided significant evidence that the 1997 reformulation of the spray-on foam insulation used on the tank has weakened the insulation material and has made it much more likely to peel off during the flight into space. The foam was reformulated because it was originally made with freon gas. 1) Return to the use of the freon-containing foam and its traditional manufacturing and application techniques and quit worrying about the negligible risk of ozone layer damage. 2) Continue using the new freon-free foam with its high associated risk of failure. 3) Continue using the new freon-free foam, but seal it again with paint. The launch assembly will be heavier, but undoubtedly safer. 4) Return to the use of the freon-containing foam, but manufacture the tank in a controlled atmosphere that would capture any freon released during the application of the foam, and modify the launch slightly in order to give the fuel tank a bit of extra momentum and propel it to a high enough altitude to prevent atmospheric re-entry and any associated atmospheric contamination risks. The ultimate conclusion may rightly be that the Shuttle is too expensive to operate. Maybe this will be the wake-up call for more private entrepreneurs like Burt Rutan and Virgin's Sir Richard Branson, who have just announced plans to begin an enterprise that will build sub-orbital space vehicles for both public and private use. NASA did its primary job -- winning the space race and landing a man on the moon -- exceptionally well. John Kennedy gave the agency not only a mission but a stringent timetable, and the agency had the blessings of the American people to spend whatever it took to keep the Russians from winning the technological Cold War. But the giant bureaucratic behemoth that NASA has become is certainly not the best method to ensure the quality, efficiency, and cost-effectiveness necessary for the next generation of space travel. hello, I love this post, I like the part of the text that talks about mourn, I think is a good article to ponder, thanks for sharing the information! Why do Country Music Writers Have a hard time getting their works out there and picked up by a star? As a ASCAP 4 X's Award winning Songwriterwriter I find it even harder to get my works out to the Public. Everything costs so much now days and I believe people don't understand what it takes in work and so on to be heard and backed. If everything checks out, the crew is expected to complete their mission to the International Space Station and then return home without incident on Sunday August 7. A tropical cyclone - cyclone formed in the tropics - the atmospheric vortex with a low atmospheric pressure in the center. In contrast, extratropical cyclones, often paired with storm wind speeds. In the world every year there is about 80 tropical cyclones. Hurricane Ivan. Photo taken from the ISS in September 2004. In the Far East and South-East Asia, tropical cyclones are called typhoons and in North and South America - hurricanes (Spanish huracán, Eng. Hurricane), on behalf of the Indian wind god Huracan. It is considered that the storm turns into a hurricane with wind speeds over 120 km / h at a speed of 180 km / h hurricane is called a strong hurricane. Do singers actually know the meaning of their songs or do they just sing the songs that song writers write? Hello, This is very nice information about "The Space Shuttle fuel tank" got here.... I have one NEws reallated to this topic. "NASA is repairing a leaky hydrogen gas line on Endeavour's fuel tank in hopes of launching the shuttle on its space station construction mission Wednesday, four days after the first try was called off. But another NASA mission, involving a pair of science spacecraft bound for the moon, is scheduled to blast off Wednesday. Top space agency officials will decide Monday whether to bump the moon mission to make way for Endeavour." Really I like your blog. It's very interesting and Informative keep posting. Your effort has resulted a tremendous one.